These three Soldiers served with the 9th Infantry Division all the way from North Africa to the Battle of the Bulge. By early 1945 when this photo was taken, few rifle companies had anyone left from the original contingent that had gone overseas in 1942. 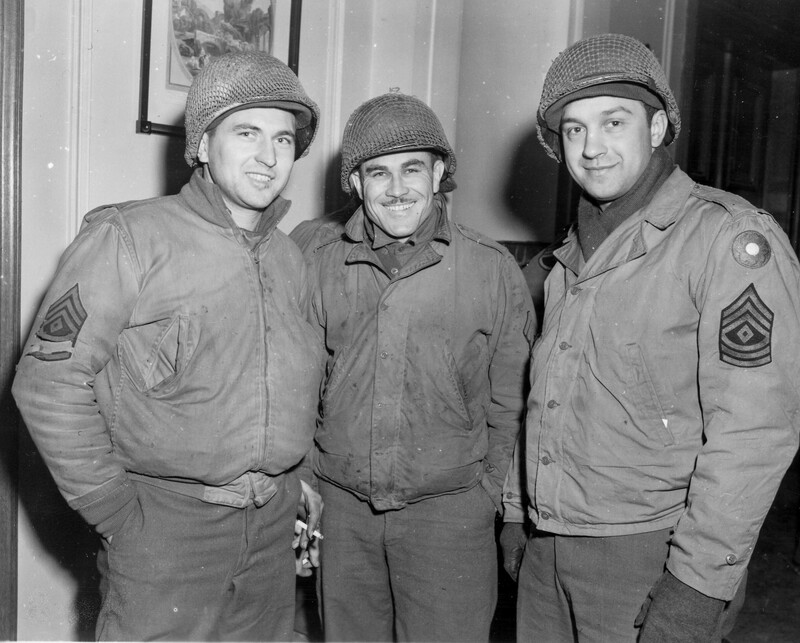 Left to Right: 1st Sergeant Louis Cobb of Waysville, KY; Tech Sergeant Michael Duda, a native New Yorker, and 1st Sergeant Joseph Gravino of Newark, New Jersey. The photo was taken on January 8, 1945 just before the men received a furlough so they could go home. The three NCO’s met at Fort Bragg before fighting in Operation Torch together, then landing on Sicily. With the 9th ID, they served in the Normandy campaign, the breakout, the Hurtgen Forest, and finally the beginning of the Bulge. Few American Warriors have been part of so many crucial campaigns. My Dad, First Sergeant John P. Quinn of Worcester, MA, would have been one of these men, as well. Served with the 26th Field Artillery, 9th ID, from Fort Bragg to Operation Torch, through war’s end and return home.